This physical exfoliator leaves skin feeling peachy smooth and soft – polishing to perfection, without upsetting your skin’s sensibilities. 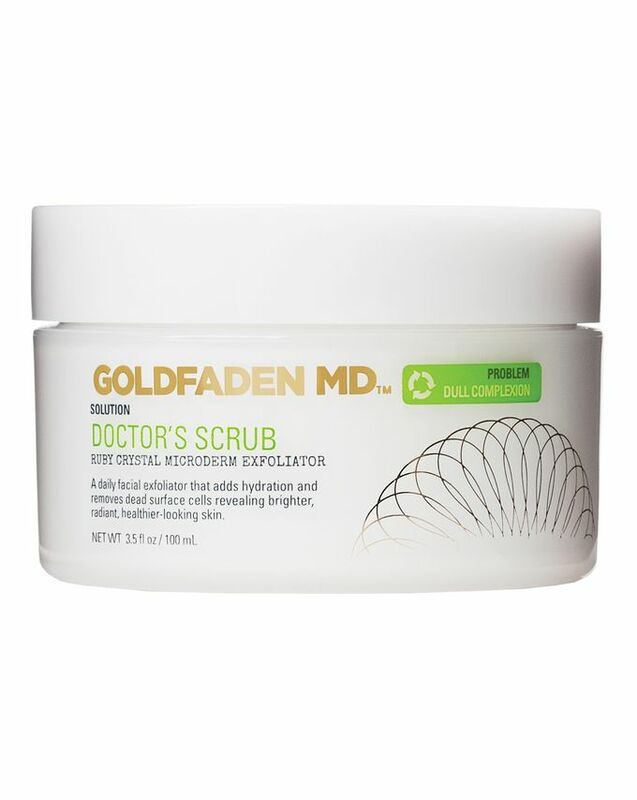 Packed with resurfacing ruby crystals to eliminate surface dirt, dead cells and debris, this reveals a refined and radiant skin surface within seconds. 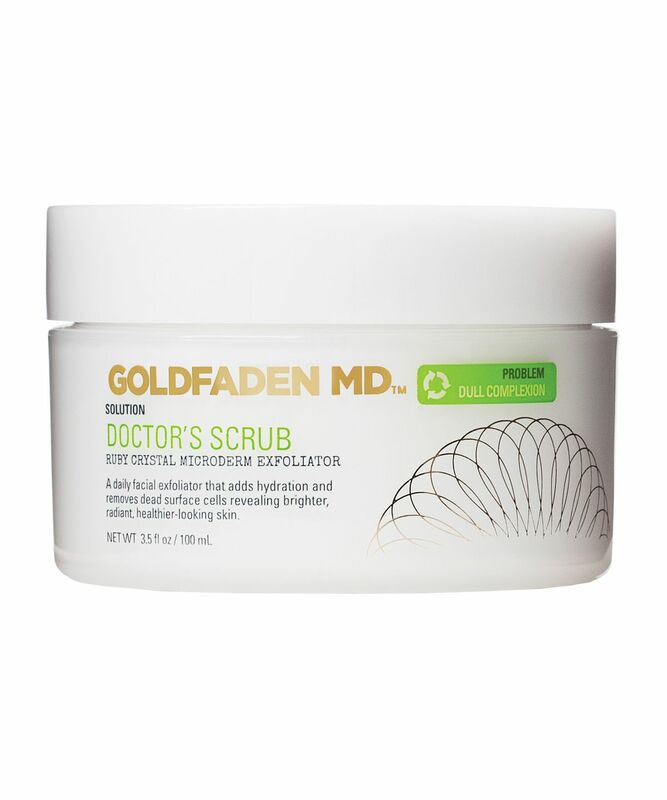 The ‘hero’ of Goldfaden MD’s range, Doctor’s Scrub is a thick paste that’s brimming with resurfacing ruby crystals – perfectly spherical to eradicate dulling dead cells without damaging delicate skin. The tiny grains are phenomenally effective – abrasive but non-irritating – while the formula is rich in line-plumping hyaluronic acid, nourishing seaweed and organic red tea extracts to promote moisture levels and neutralise the skin-ageing effects of free radicals. Suitable for men and women of all ages and skin types, use 2 – 3 times a week to keep skin looking luminous – or mix a small amount with Pure Start cleanser for a gentler, complexion-perfecting effect. Be warned – this is guilty of serious efficacy so proceed with caution if your skin’s fragile or especially reactive. Gently massage a liberal amount of exfoliating scrub onto damp skin in circular motions. Rinse thoroughly with Pure Start, Gentle Detoxifying Cleanser, to reveal fresh and radiant skin. For optimal results, use 2 - 3 times a week. Insider tip: Massage a liberal amount of Doctor's Scrub onto the neck and décolleté area twice a week for the ultimate rejuvenating body rub down! 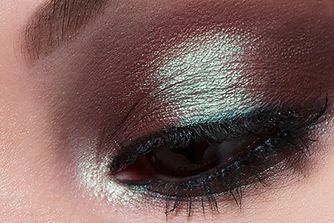 Ruby Crystals, Distilled Water, Jojoba Oil, Apricot Kernel, Squalene, Hyaluronic Acid, Laurenth-7, C13-14 Isoparaffin, Polyacrylamide, Butylene Glycol, Seaweed Extracts, Phenoethanol, Ethylhexylglycerin, Oil of Grapefruit, Red Tea Extract. 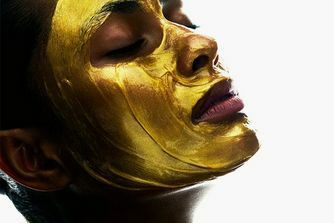 Is Gold Really Good For Your Complexion? I suffer from very dry skin and using this product made my skin feel so soft and smooth. Absolutely love it and would recommend to anyone. I'm a fan of the Dr. Lancer scrub but this is way better! I have sensitive, oily, blackhead prone skin and this scrub is absolutely divine. 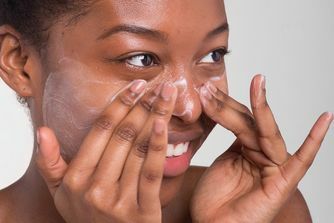 Yes, it is very fine and feels like rubbing sand over the face but I think that the key is to use a moisturizing cleanser right before it and only swiping the scrub very gently over the skin. Do not apply pressure and rub it in, just be gentle and the results speak for themselves- smooth, clear, radiant, baby soft skin. I do wish it came in a more hygienic packaging, like a tube or a pump. I do like this little jar. I got a free sample with my latest purchase and I must say AMAZING, I wouldn’t use every day as it is a little harsh but after my skin looked and felt incredible, will buy this as my next exfoliator I wouldn’t recommend for sensitive skin. I've use this product for 2 weeks now consistently (every single evening) and I've noticed that my skin is definitely brighter, softer and my pores have shrunk in size. I have oily skin and after using this scrub the feeling of oil and stickiness just go away. This is a really good product for everyday use and especially for oily skin, but be careful if you have a sensitive skin. Got a tester of this in my last order and I've never used a scrub that's more amazing than this! My skin feels amazing and i will definitely be purchasing. It's definitely too harsh and has left my skin feeling like I’ve been scratched by my kids and the cat! My skin is red and looks sun-burnt. I got a sample of this in Cult Beauty's most recent goody bag, and this is definitely my favourite new product of the bunch. My skin has never felt so smooth and hydrated and is clear and glowing. The only con is that I'm now addicted and want to use it every day, but I think it might be too strong for my skin for that. Will have to try to restrain myself to a few goes a week!